This elegant and grand party was perfect: candlelight, chandeliers, ballgowns, and tuxedos. Moving toasts, graceful dances, and a carefully coursed dinner set the tone for a gorgeous evening. Just as things seemed to be starting to wind down, the bride and groom brought out an exhilarating surprise: dancers, musicians, and party enhancers for "La Hora Loca", or "Crazy Hour", a Latin tradition that has been incredibly popular at Miami and South Florida weddings for the last couple of years. Bringing a taste of Mardi Gras or Brazil's Carnival to any event, when done right even the sleepiest guests will be back on the dance floor with energy to spare. This wedding was no exception! The dancers, with their elaborate feathered costumes making them look like exotic ostriches, taught the happy couple how to dance with them, and Venetian masquerade masks were handed out along with other props and fun. The Biltmore in Miami is a classic venue suitable for any couple who wants an elegant and memorable wedding, and adding a "Crazy Hour" only makes it better. Our combination of on-camera and off-camera flash adds a sense of depth to our reception images, illuminating dancers distinctly in the background while drawing more attention to the subjects in the foreground. 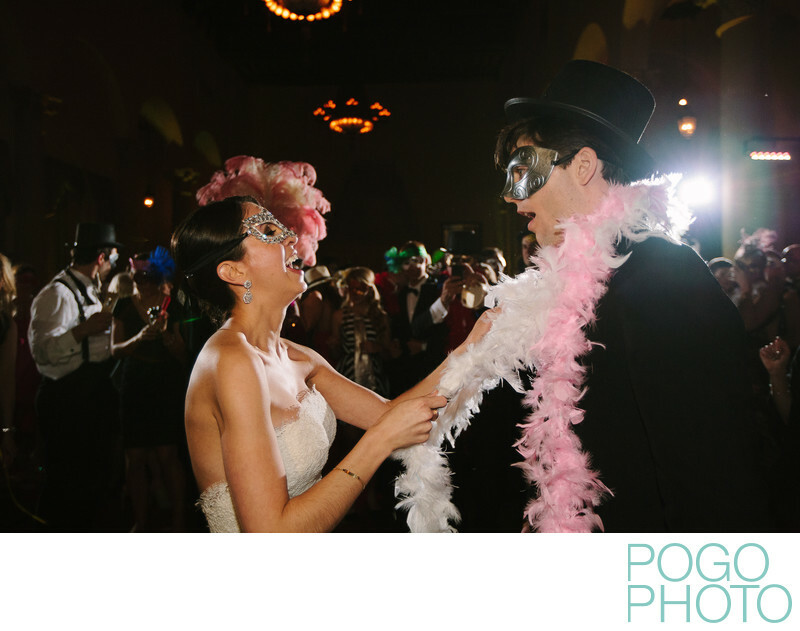 The background off-camera remote flashes also serve to highlight the curve of the bride's shoulders, and give edge lighting along her mask, collar bones, and arms, as well as giving definition to the feather boa the groom is wearing around his neck. We choose this versatile combination of reception lighting so that we can be prepared for any sudden action from any direction, without having to move a flash or instruct an assistant to help us. This keeps us very nimble and unobtrusive during the reception, and allows us to capture fleeting moments such as this giddy laughing moment between this newly married couple. 1/200; f/2.8; ISO 1600; 27.0 mm.